House of Woyaks: Santa Claus! Jason had Thursday and Friday off this week and it was great! He went with us to take Andrew to school and pick him up. The whole time to school Andrew was a bit confused. He kept saying, "Daddy work?" We told him that it was a special day so he got to stay home with us. He seemed to be alright with that answer, but he was still unsure. When it was time to pick him up and we were in the car line (I always try to get 2nd or 3rd in line), I showed Jason which window was his classroom. Andrew was so excited to see that his Daddy was in the car!! Jason was laughing because Andrew was gone for a bit but came back to the window with some friends. LOL Too funny! I love that kid! 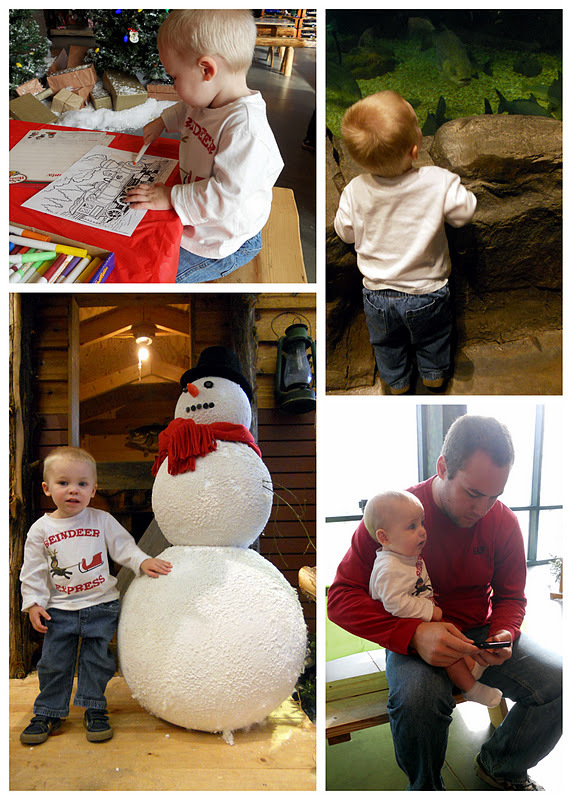 When Friday rolled around, it was a super special day - we were taking the boys to see Santa! Me: You guys want to go to Cracker Barrel for breakfast? Me: Daddy is coming, too! Andrew: No, mama. Daddy work. Me: No, Daddy is home again today. Andrew: (big smile) Oh! Daddy, mama, Alex, Andy, babies go Cack Barrell! After breakfast, Jason and I don't say anything about what is going to happen next. Andrew does ask, though. "Go?" every so often is the question down the highway. We get to Bass Pro Shop and there is a sign with Santa on it. We ask Andrew who that guy is and he says, "SANTA!" He was pretty excited! This year he sat with him! Last year...I couldn't bring myself to post the pic... But, Andrew would only sit with Santa if I did... So me and my 22-week pregnant self AND a 15 month old sat on Santa's lap... Lindsay was crackin up. I was too, but OMG, REALLY? Anyway, I'm glad that Andrew and Alex sat with him. Alex was pretty happy about the whole thing!